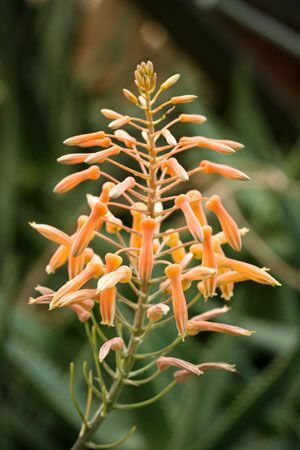 Aloe vera (Aloe barbadensis) grows in arid climates around the world. This cactus-like plant produces two distinct medicines from the gel and latex resin. ALOE GEL. The succulent leaves produce a gel comprised mainly of glucomannan polysaccharides. It hastens wound healing by increasing the synthesis of collagen and elastin, reducing inflammation and also hydrating the skin. Research supports the topical application of the gel to speed healing of thermal burns, skin-grafts. However, aloe appears ineffective at preventing or treating radiation burns and sunburns. Gel polysaccharides modulate the immune system and facilitate antibody production imparting it with antiviral activity. Aloe gel shows promising results for other disorders including lichen planus, psoriasis, aphthous stomatitis, herpes, warts, seborrheic dermatitis. ALOE RESIN. The inner leaf contains a bitter latex resin that contains anthraquinone glycosides. Like other herbs that include these compounds (senna, rhubarb, buckthorn), aloe resin act as stimulating laxatives. Anthraquinone glycosides travel to the large intestine where gut bacteria remove the sugar (glycoside) thus activating them. Free anthraquinones stimulate peristalsis and prevent electrolyte resorption from the lumen of the bowel thus increasing the volume of water in the bowl. The resin typically produces bowel movements with 6-8 hours of oral administration.